Conveying a surface that does not allow a passage through it; especially; liquids; waterproof. 1. Not easily excited or upset: Despite the bad weather conditions, Rodney had an imperturbable attitude about preparing for his trip. 2. Marked by extreme calm and composure: Aurora had an imperturbable reaction to the criticisms presented by her fellow workers about having to work overtime. © ALL rights are reserved. Characteristic of being opposed to someone or something in a very angry or determined way that can't be changed: The politician had an implacable hatred for his opponents. 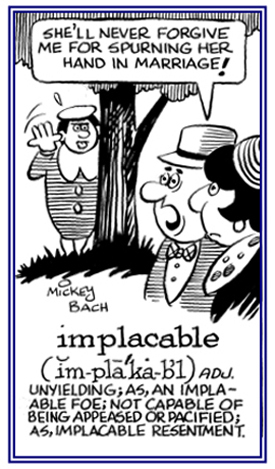 Usually people who are implacable can't be soothed or satisfied and they refuse to change their behaviors or opinions. Difficult or impossible to estimate, to assess, or to answer: There are some imponderable problems regarding the understanding of a philosophy that involves the study of ideas about life, existence, and other issues that are not part of the physical world. 1. Relating to something which is invincible, powerful, sturdy and mighty: The impregnable mountains prevented the valley from being covered with a significant amount of snow during the winter. 2. Pertaining to unassailable reasons for doing something: The local government had impregnable justifications for doing so much construction on the roads and city streets in Pete's town. 1. Not probable; unlikely to take place or to be true or to happen. 2. Having a probability too low to inspire belief. 3. Too improbable to be considered believable. 1. Capable of being improved; susceptible to improvement. 2. Capable of being used to advantage; profitable; serviceable; advantageous. The possibility of imputing or ascribing; attributable. 1. Descriptive about that which cannot be transferred to another or to others; such as, inalienable rights. 2. Relating to anything that is incapable of being repudiated or transferred to another person, etc. That which is referring to inalienable cannot be bought, sold, or transferred from one individual to another; for example, the personal rights to life and liberty guaranteed by the Constitution of the United States are inalienable. Similarly, there are various types of inalienableproperty; such as, rivers, streams, and highways. Relating to anything that is not possible to change or to modify. Relating to ground that is incapable of being plowed and cultivated to yield any normal plants: A desert is just one geographical area that is usually an inarable place to grow crops that can be utilized for human and animal consumption. Since Mexico is primarily mountainous, it has been estimated that about 85% of the country is considered to be inarable. Showing page 18 out of 43 pages of 633 main-word entries or main-word-entry groups.